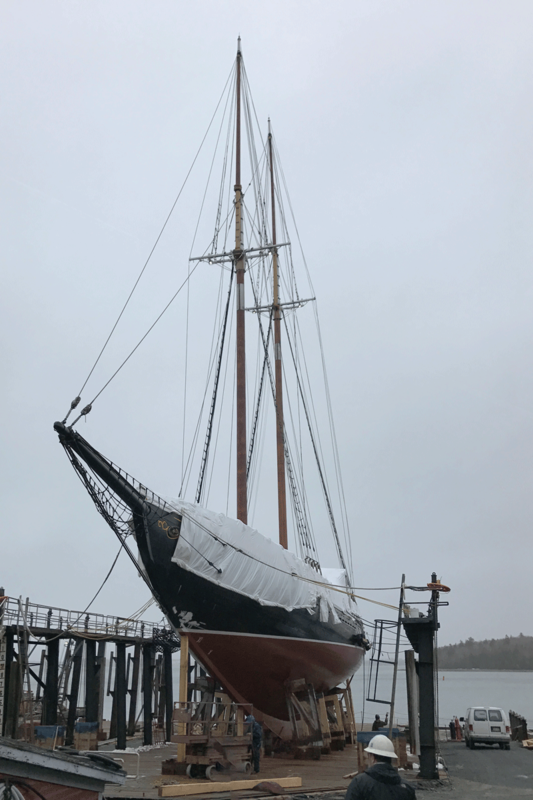 Bluenose II is now a few weeks away from sailing again in the waters off of Lunenburg, Nova Scotia, following a winter refit to her steering system. As of a few days ago, her new rudder has been hung, and it looks as if it had always been there. It was more than a year ago now that Langan Design Partners was approached by the Province of Nova Scotia to help them decide what to do with a steering system that some people had expressed concerns about. We took a good hard look at the complete steering system and recommended that it be replaced with either a new composite solution (if there was no appetite to do some surgery on the stern of the vessel), or return her to her original configuration with a new wood rudder. The latter option was picked, and Langan Design was tasked with (re)designing the complete steering package. 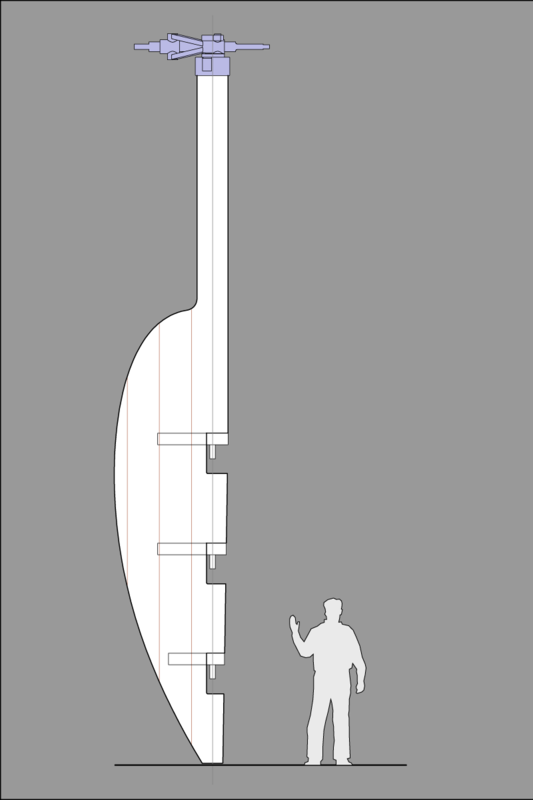 most classification societies have long stopped adapting their rules to account for wood rudders for vessels of this size. For this new rudder, we approached ABS and asked that the new rudder be designed under ABS’s 1943 “Rules for the Construction and Classification of Wood Ships” as this rule was used for other parts of the vessel. Although the resulting scantlings ended up being a little larger than the original Bluenose II, the results was much the same. A large oak log (25’ by 18” x 16”) was used for the rudder stock, the blade was made from local spruce, the pintles and gudgeons cast and machined out of bronze. When Bluenose II was relaunched in 2014 she had been equipped with a new custom worm-gear manual steerer. This new steerer is an impressive piece of mechanical engineering, and was based on the exact dimensions of Bluenose II’s original steerer. The same design was kept for the new rudder, but was adapted to the larger diameter wood stock. This way many of the existing parts were re-used. 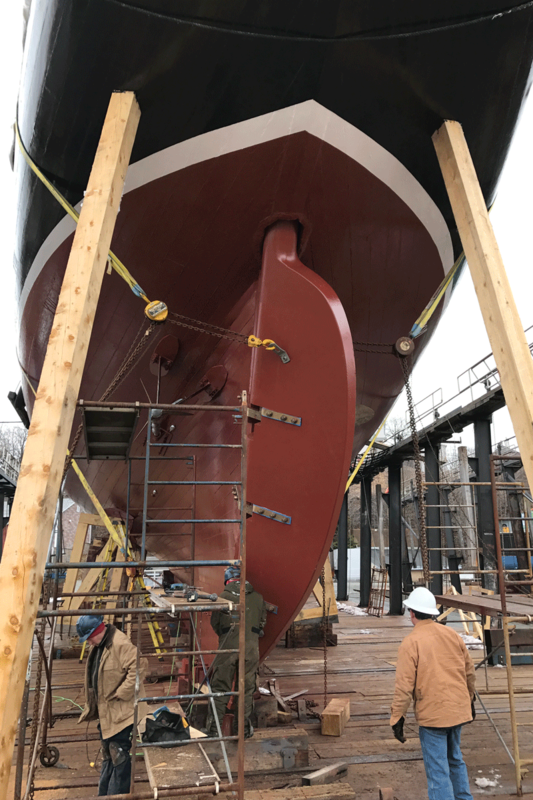 The shipyard chosen by the Province to do the work , Snyder’s Shipyard in Dayspring, Nova Scotia, has a long history with the vessel which goes back to the original vessel. 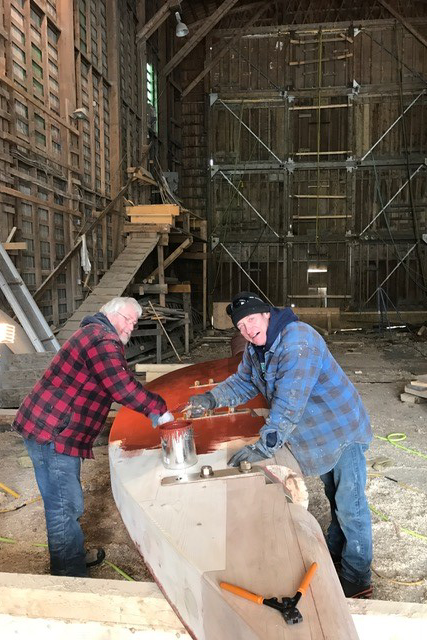 Several of the shipwrights working on the project had family that worked on the original Bluenose, worked on the first Bluenose II (built in 1964), and on this latest rebuild of Bluenose II launched in 2014. Their expertise, craftsmanship and dedication are an integral part of the success of this refit, and the result speaks for itself. 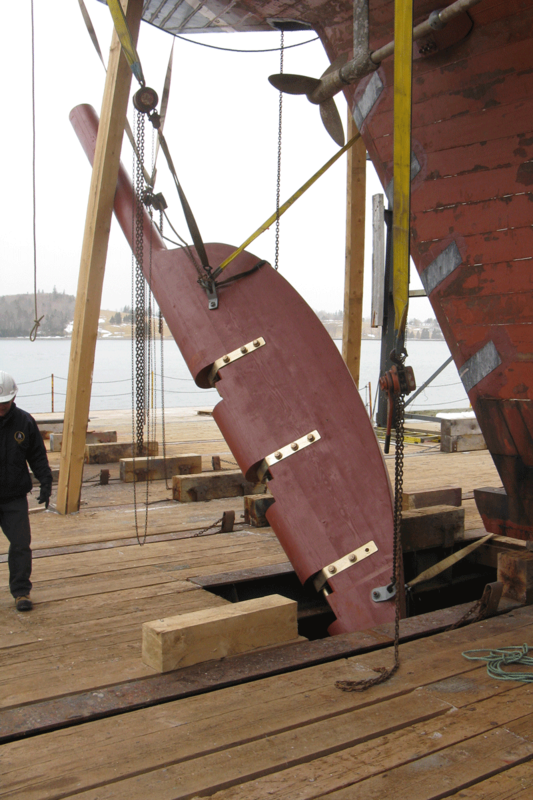 Vern Shea, a talented local designer who was heavily involved with the rebuild of Bluenose II, helped with integrating the new rudder into the existing wood structure. All in all this was a great team effort. The rudder is now hung, swings freely and looks right at home on Bluenose II’s stern. Sea trials are scheduled for May, and Bluenose II has an active schedule planned for Canada’s 150 year celebration: She will be plying the waters of the Canadian Maritime provinces, attending a tall ship reunion in Lunenburg, and will make her way up the St Lawrence river to Quebec City’s “Canada 150” celebration.